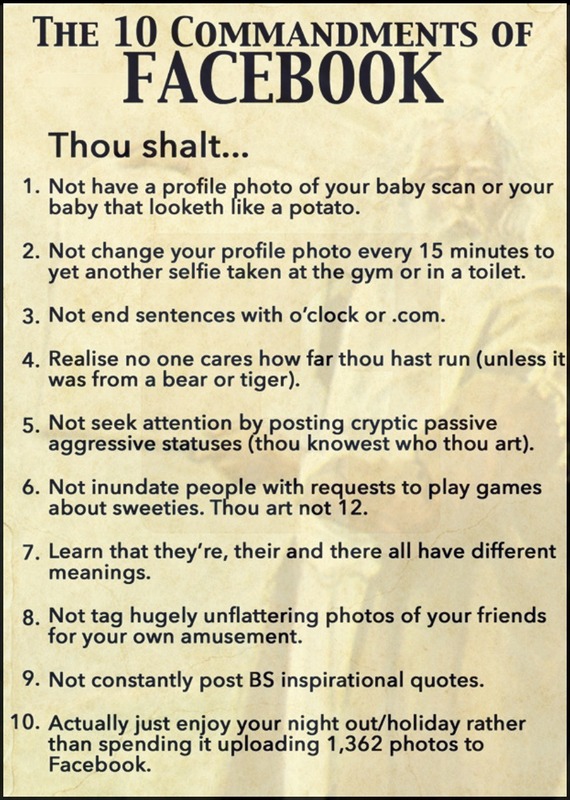 Daveswordsofwisdom.com: The 10 Commandments of Facebook. The 10 Commandments of Facebook. 2. Not change your profile photo every 15 minutes to yet another selfie taken at the gym or in the toilet! 6. Not inundate people with requests to play games about sweeties. Thou art not 12! 7. Lear that they're, their and there all have different meanings. 8. Not tag hugely unflattering photos of your friends for your own amusement. 10. Actually just enjoy your night out or holiday rather than spending it uploading 1,362 photos to Facebook. Remember, this is just a bit of fun to tease your family and friends so take it as such. A Baptist Church members went out on the streets and ask 200 people that were in a relationship or married. The question what do you believe is the biggest problem preventing your relationship from growing in the right direction. They all replied social media. Put down your phone and engage with your friend, family member, loved one. How in the world can u think like that? I appreciate it.